I rarely get to watch Filipino indie films. It turns out they are a real gem and I feel like I'm missing out on a lot of them. 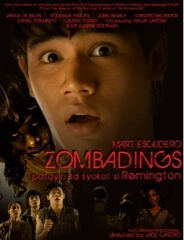 I got to watch Zombadings on an advance screening at SM City Cagayan de Oro last August 18. I really did not expect much from it. I was just excited at the thought of being able to watch it in advance. I was totally surprised at how good it really was. It's a story about homosexuality and its implications to the society presented in a very humorous and light-hearted way. I love the story, the cast and the script. It's definitely worth watching and without a doubt greatly deserving of a rating of 10. Long live these kind of good Filipino indie films!